Do you EVER have digestive concerns? Do you ever feel like your stomach has expanded more than it should? Do you feel like you stomach gets upset? Or maybe things are not moving properly? Do you feel pain or burning in your stomach or throat? Or maybe some foods just don’t agree with you? The stomach is often referred to as the “second brain.” In fact, it contains more than 100 million nerve cells and is responsible for producing roughly 90 percent of the body’s serotonin! Because of the vital function it plays in a healthy life, we want you to have as many tools as possible for taking care of your gut. Watch these videos for more details on how important it is to support a healthy digestive system. I have an affordable starter kit option that will get you started with oils and products for specifically for your digestive needs PLUS you will get a week long in depth education series with lots of juicy details on what essential oils are, how they help you and HOW to use all the oils in your starter kit for your digestive concerns! This starter pack will be your new medicine cabinet for all things digestive! 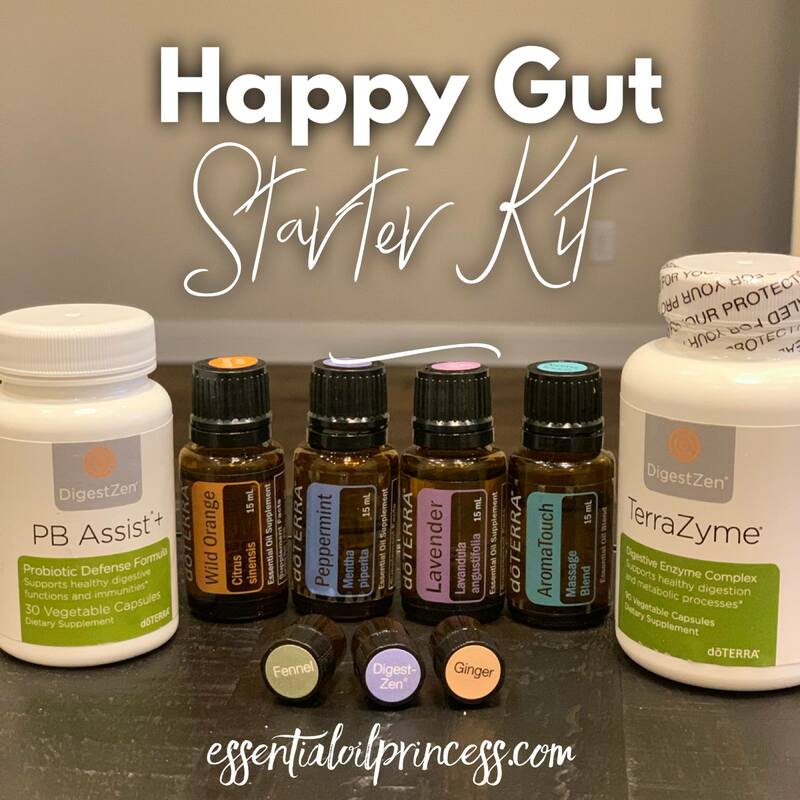 What it included in the “Happy Gut” Starter kit?? There are 6 billion active probiotic cultures and soluble pre-biotics to promote GI tract health by helping prevent bad bacteria from taking over. The probiotic and prebiotic cultures do this by competing for nutrients necessary for growth by crowding out bad bacteria as they compete for intestinal surface area. They also produce chemical by-products that create an intestinal environment in which “bad” microorganisms cannot flourish. You might think that you don’t need probiotics but there are many things in our diet, water, and even the products we use on our body that can deplete our healthy gut flora. It is recommended that you take a probiotic daily for maintaining a healthy gut. A blend of 10 active whole food enzymes that are often deficient in cooked, processed, and preservative – laden foods. It helps with the digestion of proteins, fats, complex carbs, sugars, fiber, and other food nutrients. It also helps support optimal health because one of the benefits of better digestion is increased cellular energy (so you don’t feel tired during the day) and less stomach discomfort because food is moving through the digestive system better. The main chemical component in Peppermint essential oil is menthol. Menthol contains energizing properties that contribute to the overall energizing effect of Peppermint oil. Menthol is known to soothe and relax the muscle that lines the colon. * The relaxing of colon muscle reduces the movement of bowels, which eases occasional bowel looseness.